Per Variety, "Die a Little explores how the lives of a schoolteacher and her LAPD detective brother are turned upside down by a mysterious woman." Will this fresman finish with a Grammy before a degree? If Andrew Dudum (W'11) were to try out for any of Penn's a capella groups, odds are he would have surely made it. Instead this talented undergrad is continuing on a solo track he started before he even got to Penn. Per the DP, a few weeks ago Andrew was selected to headline the Rock the Mic for Darfur concert which helped raise funds for the Darfur Alert Coalition. Besides that, he's on an independent record label and already has a CD released. 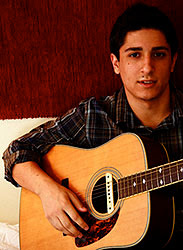 This talented musician is also accomplished in another area which landed him at Carnegie Hall! Click here to find out! "Notre projet final pour FRE140 a UPENN. Voila les finalistes pour Miss Francophone 2007! Bon travail!" With the 1 semester of French I took, if I'm understanding the above correctly, I think this is a French class project video for a "Miss Francophone 2007" contest. 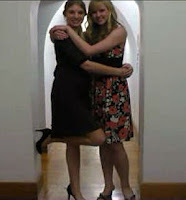 I think the Quad hallway is supposed to resemble a catwalk or something. Regardless, another entertaining class project. 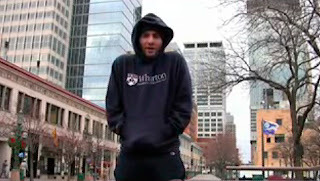 Typically, wearing my Penn sweatshirts, t-shirts and class ring lead to random Penn introductions. 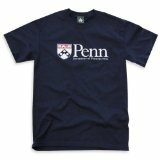 Anyone out there have any stories where you've randomly met Penn folks because of some sort of Penn piece of wardrobe you were wearing? Comment below! As I reported here, Penn alum Emmy award winning entertainment reporter Emily Frances is the subject of a 3 part, very personal story on NY's CW11. She has allowed the cameras to follow her as she undergoes a procedure to freeze her eggs. "That Management 100 Buy Buy Buy video is good stuff, but Team RHDH's Super Sweet Sixteen video is pretty awesome as well. " This is so Wharton, isn't it? Well, Alex is right. His clever group did a pretty funny parody for their Mgmt 100 class based on MTV's "My Super Sweet 16". A month ago I reported on writer/Director Jon Hurwitz's (W'00) new trailer for Harold & Kumar 2. 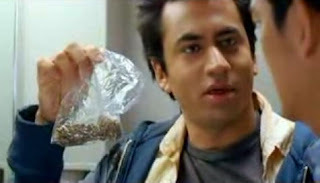 A still from the Harold and Kumar 2 red band trailer. Comedian Aaron Karo (W'01) just went on tour across the country and documented his week. As you'll see in the video, Aaron sums up his week best: "Drank too much, slept too little, lot of work, good times..."
Check out his tour video here!